Derren Brown’s Ghost Train has been open for less than a year and has already received its first upgrade. The update is called “Rise of the Demon,” and quite a few things have changed from the first version of the VR horror ride. Thorpe Park, the amusement park that hosts the attraction, is very careful about what is revealed and implores riders to keep hushed after disembarking. While no major details will be exposed, this article may contain some mild spoilers for the ride, as reported by Engadget. Use your judgment as to how far to continue reading. 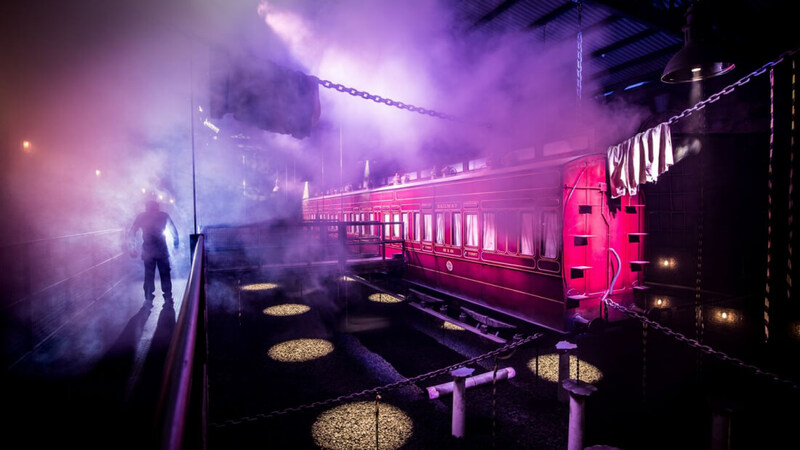 Ghost Train is the brainchild of mentalist and illusionist Derren Brown. He wanted to create a theme park attraction that was both thrilling and fun but at the same time, more interactive. Virtual reality lends itself perfectly to what Brown wanted to design. It would be a ride that combined the immersion of VR with the physical bumps and jolts of a thrill ride. However, when the attraction debuted in July 2016, its hype was bigger than its bite. One of the main complaints that Digital Spy had was with the headsets. The attraction uses the HTC Vive and fiddling with the velcro straps was distracting. Also, the "safety masks," as they are called, did not fit well. However, the worse part about the headsets was that they did not cut out the sound of the other passengers, which broke the illusion that you were alone on an empty train. In the Rise of the Demon update, Brown worked with Figment Productions to implement more tech to the exhibition and improve the immersion and overall experience. They combined 360-degree video with a LIDAR mesh to enhance the visual effects. This video shows reactions to the new visuals. Plus the chaos and theater that goes on while boarding, helps to mask this slight discrepancy since most of the people that you board with you will probably not know. Like the previous version, the ride is segmented into acts, and they are pretty much the same in format. The introduction begins outside of the attraction where live actors tell you about a warehouse that was found with a haunted Victorian-era train inside suspended from iron chains. After being ushered inside and donning the headsets, the first VR segment plays out. It is unknown what happens in that VR segment, but it is certain to have created a state of tension to set up for the chaotic ushering into the next segment. That segment is more live theater where you exit what used to be an old train but has somehow transformed into a modern U.K. subway train, and you appear to be in a subway station rather than a warehouse. During this portion, actors herd you quickly into another modern train, while scary things happen. I will not mention what the scary things are, but if you wish, you can get an idea from videos of the early vision of the ride that are floating around. After getting on the second train, another VR segment occurs, and the show concludes. When you exit, the modern train has again become the old Victorian one, and you are back in the warehouse again. Engadget said the first time through the ride was flawless, but the second experience hit some snags that left the live actors trying to kill time for 15 minutes. However, for the most part, the ride experience is mostly seamless and everything that happens from the moment you step on the platform is part of the story, which is cool. If you have ever been to Star Trek: The Experience at the top of the Hilton in Las Vegas, Nevada, then you have participated in a similar production. Derren Brown and Figment have more ideas in store for the Ghost Train’s future, but implementing those plans will depend on how well Rise of the Demon does. If you live in England and have been on Derren Brown’s Ghost Train (the original or Rise of the Demon), let us know what you thought in the comments. No big spoilers though. Save those for private conversations.